Put the sugar in a pan, add the almond powder and the whole almond and bring to a boil. Rest for 12 hours. The following day, filter your syrup and add a drop of Orange flower water and Rose water to it. 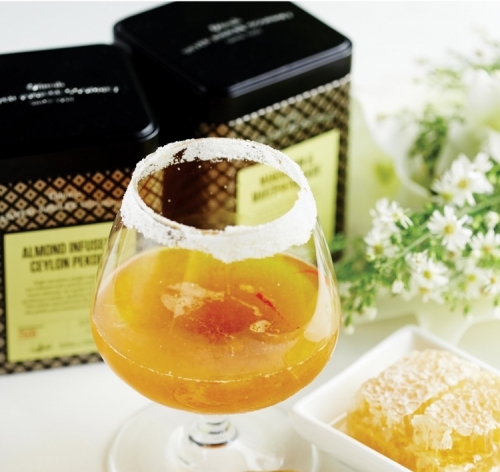 Into a shaker full of tea and saffron ice cubes, add the lime and pineapple juices, the Orgeat syrup and the infused Almond Pekoe Tea with Manuka honey. Shake well. Garnish the rim of a digestive glass with saffron infused sugar, add one cube of tea and saffron ice into it and strain the shaken contents into the glass. Serve chilled. * Infuse 6 spoons of Mandarin and Marzipan Tea in 700ml of water for 4mins. Strain into the ice tray and add 1 Terrezza saffron thread (100% New Zealand Saffron) to each ice cube. Let it set in the freezer for 8 hours.